Each of these Australian establishments is so much more than just your average accommodation option; they’ve taken the ‘hotel as art’ philosophy to heart. Art lovers, you may not love them all but at least one of these aesthetically pleasing and challenging hotels will surely be to your taste. Henry Jones is a sumptuous contradiction, a living, breathing gallery of contemporary artworks hanging in a 19th Century post-industrial space. One for the art buyer and collector, there are hundreds of works punctuating the huge wooden beams and stone walls of the common areas and intimately hung in the 56 rooms. Bedtime Stories: Siesta by Katy Woodroffe at Henry Jones Art Hotel, Hobart (courtesy of Colville Gallery, Salamanca). And interiors aside, a view across the harbour to Mount Wellington, through the building’s original windows, is artful in itself. This growing stable of (so far) mostly Victorian-based boutique hotels are a must not just for their art and design ascetics but also for hipper than hip inner-city locations. The Cullen Melbourne (Prahan), The Olsen (South Yarra), The Blackman (St Kilda Road), The Larwill (Parkville), The Schaller Studio Bendigo and the new kid on the Adelaide block, The Watson in Walkerville, are all named after contemporary Australian artists whose works adorn the walls. There are hands and minds-on experiences too, with tours and art utensils available for those wishing to put brush to canvas. Tommy Watson’s (Pitjantjatjara) works feature at the eponymous The Watson, Adelaide, an Art Series hotel. So which Art Series for you? Beauty is in the eye of the beholder: the architectural and art styles are vastly different, ranging from the exuberant works of Aboriginal artist Tommy Watson (Adelaide) to grungy pieces by Archibald prize winner Adam Cullen in Prahan. As far as rooms go, the Cullen’s penthouse we sampled a few years back was pretty amazing. The Johnson, due to open in Brisbane in June 2016, is the next in the collection (named after Michael Johnson). Yes, you can stay at MONA – Australia’s most extraordinary modern art gallery, and the largest privately funded museum in the country – well, right next to it. You have the choice of eight private pavilions that overlook the River Derwent, each showcasing private works from the MONA collection as well as artists such as Brett Whitely and Arthur Boyd. There is a lucky dip of serious collectable accessories interspersed in the rooms too, such as Ross Lovegrove’s Supernatural chairs and Philippe Starck-designed lamps, along with plenty of bespoke Tassie furniture. The exterior steel and aluminium design of the pavilions are themselves yet another MONA talking point. The ‘Halcyon Hang’ – Halcyon House, Cabarita Beach (photo: Peter Tarasiuk). It’s as much about the precision of display as is it about the art itself in this blue-and-white themed masterpiece of reinvention. The 21 rooms at seaside boutique hotel Halycon House are replete with meticulously selected images – some of which have been snapped up in flea markets. The art is diverse – ranging from seascapes to old Australian art in water colours and oils – yet is arranged consistently artfully in what’s become known as the ‘Halycon Hang’. The eye for detail, the overarching design (overseen by designer Anna Spiro), and corralling of multiple elements. from furnishings to the wallpaper, is breathtaking. The blue and white tiling is a highlight, especially for the enthusiasts. The ‘Mother Earth’ room, Majestic Minima Adelaide. As far as room amenities go, this budget-friendly hipster from Adelaide is fairly minimalist (small desk, king-sized bed, compact bathroom and balcony). But each compact room also happens to be an uber-vibrant canvas. The themed art rooms have wall-sized murals in various modern styles, from stencil art to cartoons, all executed by diverse South Australian artists. The disparate themes include ‘Psychedelic Seeds of Life’ to the question-asking ‘Evolution’ room, which portrays a giant monkey and a God-like image interacting. You can browse the artwork and book the room of your choice or take a lucky dip. The cute bed cushions by Gretel Girl add yet another dimension to the experience. 56 artists, makers and designers collaborated to make Hotel Hotel what it is today (photo: John Gollings). The lobby of this unbound urban space is made up of thousands of stretches of stacked re-purposed timber, which contrasts with the sleek polished building beneath it. Rooms are made up of natural clay rendered walls and hardwood windows that aim to reflect Australian aesthetic. Original contemporary Australia artworks hang in each room, above reupholstered and restored vintage sofas. The hotel, itself was created as a collaboration between 56 different artists, makers and designers, and houses an art collection inspired by Walter Burley Griffin and Marion Mahoney Griffin. Hotel Hotels exists within the Nishi building, one of the bolder statements on Canberra’s low-lying skyline. Loud and proud at TRYP Brisbane (king room). Tryp Fortitude Valley Hotel is housed in what was once the meeting place of the Royal Antediluvian Order of Buffaloes, the Brisbane chapter of a mysterious and secret international society. Now it’s wall-to-wall with street art created by the likes of Fintan Magee, Numskull, Rone and Beastman, offering guests an immersive experience. The queen room features a custom-made glass basin scrawled in graffiti. A massive psychedelic mural that looks like a wild combination of Banksy and Damien Hirst sits as a backdrop to the king courtyard room. Tryp will be never be accused of lacking colour, that’s for sure. Grab a map, as if the hotel is a gallery itself, and explore some of the inspiring and poignant artworks that hang on the Westin Melbourne’s walls. The common areas boast an extensive collection of works from Australia’s leading contemporary artists. 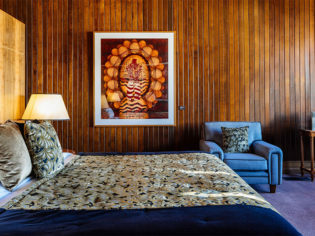 Highly regarded curator John Buckley has worked with the hotel’s interior designer in an attempt to match the art with the hotel’s aesthetic and atmosphere. Keep an eye out for work by Imants Tillers and John Young and limited-edition prints by photographic artists Christopher Koller and Susan Hewitt. The Paris Opera has commissioned a series of haunting works by Bill Henson that are featured throughout the ground floor. Digital space – QT Sydney.